The recent discovery of a new form of contagious cancer among Tasmanian devils — the second to afflict the species — suggests we still have a lot to learn about how cancer spreads. It also suggests that transmissible cancer may be more common in nature than previously assumed. To date, scientists have observed only three strains of naturally occurring transmissible cancers, and they affect dogs, soft-shell clams, and Tasmanian devils. Unlike more “conventional” forms of the disease, these cancers spread between individuals through the transfer of living cancer cells. Earlier this year, scientists documented a bizarre case in which a man was found to host cancerous tapeworm tumors in his brain, revealing yet another mechanism for cancer to spread from one individual to another, or in this case, one species to another. At any rate, the few documented cases of transmissible cancer suggests it’s exceptionally rare in nature. The recent discovery of a second strain of contagious cancer among Tasmanian devils is detailed in the Proceedings of the National Academy of Science and suggests it may be more common than we assumed. It’s also casting doubt on what we think we know about cancer and how it mutates into contagious versions. Cancer happens when cells in the body spread uncontrollably. Sometimes, it spreads and invades other parts of the body in a process known as “metastasis.” In most cases, however, cancer cannot survive outside of the original host. Transmissible cancers, on the other hand, have acquired this capacity. They can make the leap from one individual to another — typically through close contact behaviors – and infect new hosts. Nearly 20 years ago, scientists first discovered contagious tumors among populations of Tasmanian devils in north-eastern Tasmania. This particular form of transmissible cancer, known as DFT1, spreads quickly throughout the animal’s body, and the disease typically proves fatal within months of the appearance of symptoms. DFT1 has spread through devil populations like wildfire, and the iconic species is now officially listed as endangered. Adding insult to injury, a research team from the Menzies Institute for Medical Research at the University of Tasmania, along with researchers from Cambridge University, has confirmed a second and distinct form of transmissible cancer among Tasmanian devils. The discovery was made last year when a devil was found with tumors in the southeastern part of the island. “The second cancer causes tumours on the face that are outwardly indistinguishable from the previously-discovered cancer,” said study lead author Ruth Pye in a statement. This cancer, dubbed DFT2, may look the same as DFT1, but analysis shows it’s genetically distinct. This strain, which carries different chromosomal rearrangements, has now been confirmed in eight devil specimens. So Tasmanian devils have spawned at least two different forms of transmissible cancer. Contagious tumors aren’t as rare as previously assumed. 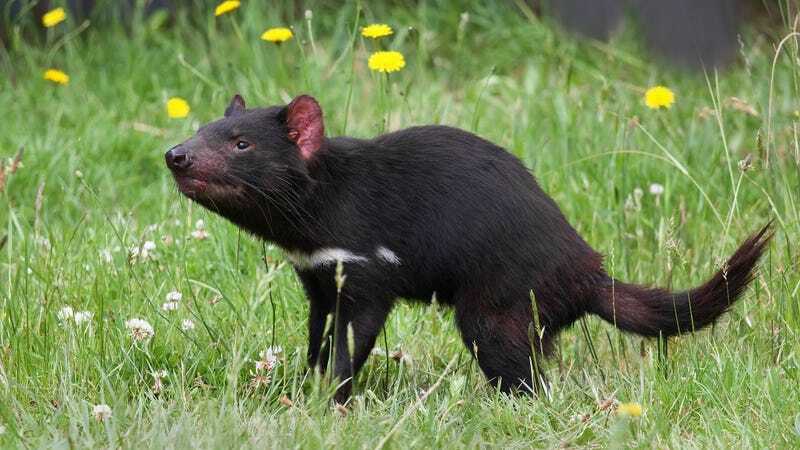 The researchers say that the contagious cancers are taking advantage of distinct Tasmanian devil behaviors and the low genetic diversity among the species. These marsupial carnivores are known for their ferocity, and they frequently bite each other while feeding and mating, contributing to the spread of the disease. It’s not known if the new form of cancer is extensive among the devil population, or when it first emerged. Scientists are now worried that other, as-yet-udiscovered transmissible cancers may exist in this species. This adds a further complication for conservationists who are working hard to save the species from extinction. The possibility that clonally transmissible cancers may arise more frequently in nature than previously considered warrants further investigation of the risk that such diseases could arise in humans. Although transfer of cancer cells between two humans has been reported in rare circumstances, involving injury, organ transplantation, experimental treatments, or pregnancy, no human cancer has been observed to naturally transmit between more than two human hosts. The discovery of a second transmissible cancer in Tasmanian devils changes our perception of the potential of cancer cells to adapt to new niches as parasitic clonal cell lineages. Regardless of whether the plight of Tasmanian devils represents the existence of a common pathological process that has previously been overlooked, is the consequence of an unfortunate species-specific vulnerability, or has arisen due to an exceptionally improbable concomitance of events, clarification of the biological basis of DFT2 promises to illuminate important concepts underpinning cancer evolution. You can check out the entire study at PNAS: “A second transmissible cancer in Tasmanian devils”.